You might think of Meriwether Lewis (1774-1809) as the leader of the Lewis and Clark Expedition and you would be right. But Jefferson tasked Lewis, on the journey, with finding plants. Lewis, with occasional help from William Clark, Sacagawea, and others, found and collected more than 250 plants on the trip from Camp Dubois near St. Louis to the Pacific and back. Meriwether Lewis’s 244th birthday is this Saturday August 18. 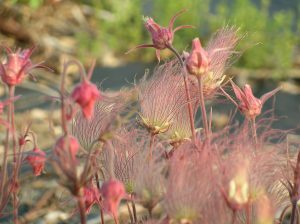 On the return trip the Corps of Discovery, anxious to return home, waited for snows to melt in the Rocky Mountains, Lewis collected Geum triflorum Prairie smoke, on the Wieppe Prairie in present-day Idaho. Its flower is a purplish-pink dangling cup, blooming in early summer. Hair-like, pink seed heads follow looking like the hair on a troll doll. It is native to Wisconsin and most parts of North America.